To start with, I’d like to ask for some help. Some time ago between January and now I have come across on the Web a blog post about needle felting and I loved it so much. I left a comment there and also thought I saved the link, but apparently I didn’t :(. It was an easy tutorial to explain basics of needle felting and featured two projects – one was flat abstract pattern with swirls, and then some project with more volume. The author used kitchen sponge as the background. I think I came across this either as a part YOP or some linky party, but not sure at all. Anyway, if anyone knows what I am talking about, I’d be ever so grateful for a link! 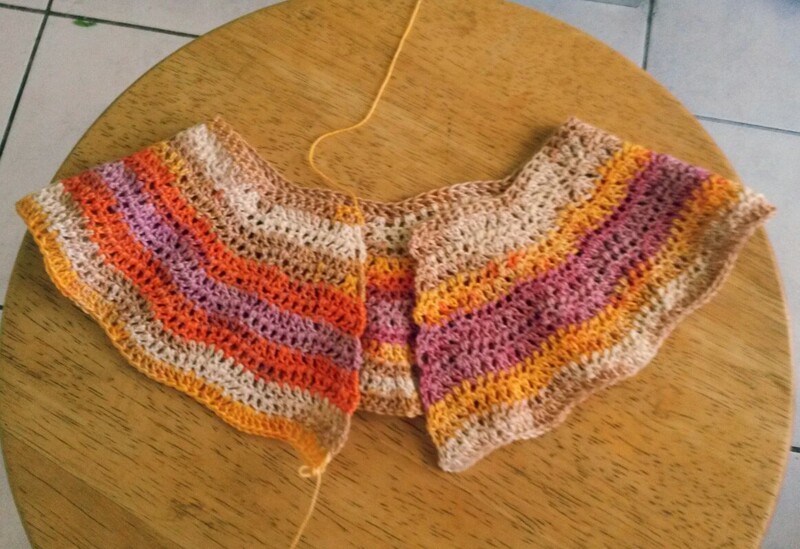 As for me, I have been working on the yoke for the cardigan for my little girl, and I’m about half way through. I can’t wait to get to forming the sleeves to see how it will fit. Separator image Posted in My kniting & crochet and tagged with crochet, Riviera Waves, YOP. This is a good demonstration of needle felting. 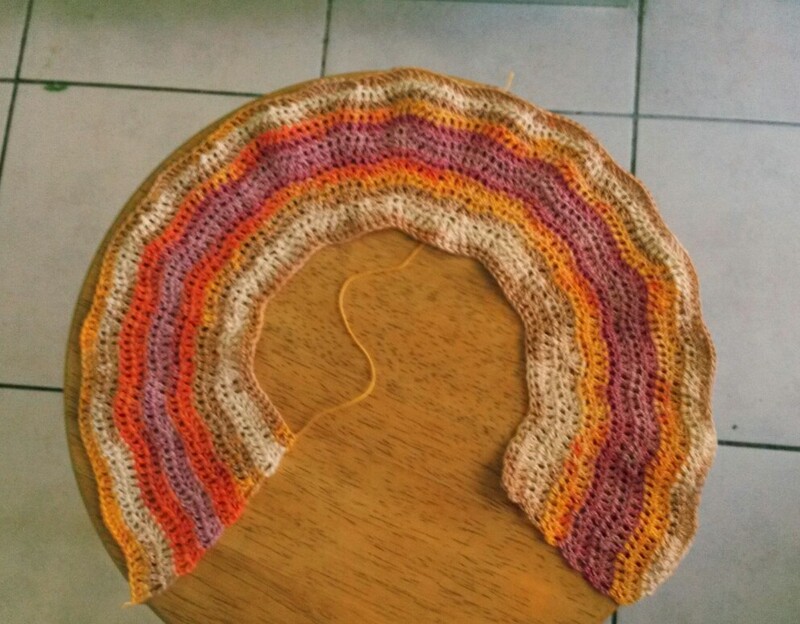 Your cardigan is looking colourful so far! Thanks a lot Teresa! Not the one I was looking for, but it’s interesting too. I don’t recall it, I’m so sorry. Your cardigan looks glorious. I am not sure what link either… Sorry I could not help! Cute sweater! I love when top down sweaters start to come together! No help from me for Needle Felting either, sorry! A very cute start to the card – love the warm colours and the ripple pattern! What a darling sweater that is going to turn out to be! I love the colors you’re using. Sorry, I’m no help on needle felting but I checked out the MrsPollyRogers link and i want to make that pillow with the circles! LOL! Good Luck! Thank you. This is a lovely self striping yarn. I’d love to get more in different colour combinations for future projects. Thank you for stopping by. I know it’s a long shot, but maybe I’ll be lucky, who knows.. I love all the lovely colours on the cardigan. It’s the same yarn I used for Riviera Skies top. I love it..